Jean Claude Garnier was born on 10 March 1948 at Rouen in Normandy, France. Seriously ill during his childhood, he discovered yoga by reading Indra Devi’s book; she was the first American to study yoga with Sri Krishnamacharya. He was then 14 years old. He followed his path with the companions of the “Communauté de l’Arche”, founded by Lanza Del Vasto, the first Christian disciple of Mahatma Gandhi. He was 20 when, on their recommendation, he met Jean-Paul Boudon (Satyananda Bihar School) and B.K.S. Iyengar. At the beginning of his first two-year trip to India, while digging wells and improving land for agriculture, he met Vinoba Bhave, Gandhi’s successor. He studied yoga with Swami Gitanandha in Pondicherry and then stayed for a time at Sri Aurobindo’s ashram where he met “The Mother”. He came back to France in 1972, and lived for a few months in Father Dechanet’s hermitage. 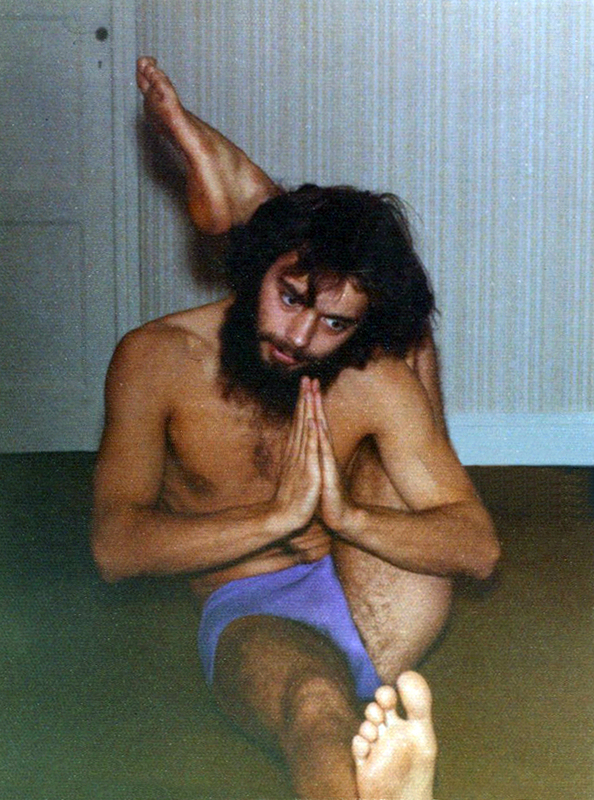 In 1973 he started his first yoga classes in Rouen. At the same time, he pursued his yoga teacher training with Denise and André Van Lysebeth in Switzerland. He then studied with Jean-Bernard Rishi who at that time was one of Pattabhi Jois’s students. 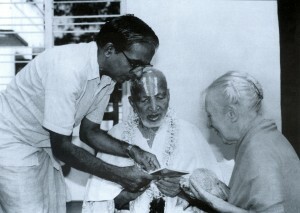 He met BKS Iyengar through Noël Perrez and was so impressed that he went to Puna to study with him for several years. On a trip in South India in 1978 he met Sri Pattabhi Jois who became his Master. He studied with him every year until 1998. To better understand anatomy and the locomotor system, Jean Claude decided to learn general and cranial osteopathy. He then began psycho-corporal psychotherapy in accordance with W. Reich’s theories, and followed several courses to become a psychotherapist. He then learned energetic osteopathy, acupuncture and dietetics. He has been a vegetarian for 47 years. Jean Claude enjoys combining all his knowledge and experience. He divides his time between teaching yoga – in Brussels, at the Institute he has lovingly created in Uccle, and in France, Greece and India – and giving treatment in energetic, general and cranial osteopathy, and acupuncture. The yoga teaching he gives is faithful to the Yoga Korunta transmitted by Sri Pattabhi Jois at the “Asthanga Research Institute” in Mysore. This entry was posted in The Teachers and tagged acupuncture, André, Aurobindo, Auroville, B.K.S. Iyengar, Belgium, Bihar School, Brussels, career, Denise Van Lysebeth, dietary, encounters, Father Dechanet, France, Greece, India, Indra DEVI, Jean Claude Garnier, Krishnamacharya, Lanza Del Vasto, Mahatma Gandhi, Mother, Normandy, osteopathy, Pattabhi Jois, Pondicherry Puducherry, Rouen, Satyānanda, Swami Gītānandha, Training, Vinoba Bhave, Yoga on 25 December 2014 by Jean-Claude Garnier. The coast of Coromandel, close to Pondicherry, is ideally suited for a charming stay: beaches of white sand, Hindu temple complexes, small fishing villages, the ancient French counter where the past is still present, a stay in a charming hotel – all this will make your Yoga workshop an unforgettable experience. The town, Pondicherry or Puducherry, is often referred to as Pondy. Pondicherry has a unique architecture, inherited from a mixture of cultures and its French and Tamil colonial past. Pondicherry has a special ambience and charm, completely different from the rest of India. Formerly a French colony, today it is an Indian territory, 160 km from Chennai (Madras), 100 km from Mahābalipuram, along the Coast of Coromandel, in the Gulf of Bengal. Take a stroll, walking or on a cycle rickshaw, through the charming streets with evocative names, where you can admire the finest examples of colonial architecture. Immerse yourself in the old marketplace, at the junction of Nehru Street & Mahatma Gandhi Road, with its surprising fragrances from the fish, fruit, vegetable and flower markets, buy coffee or tea in “The Lakshmi Coffee”, go out for lunch at “Energy Home”, a surprising and absolutely delicious cuisine, 35a, Chety Street. Visit Sri Aurobindo’s ashram in Auroville. Enjoy a French breakfast at “Baker Street”, 123, Bussy Street, or an Indian one in a house with traditional Tamil architecture, the “Maison Perumal”, 44 Perumal Koil Street: dosai, idly, kalapam and uthappam, from 7.30 until 10.00. Pondicherry is 100 km away from Mahābalipuram, 2 hours by bus or 11/2 hours by car. This entry was posted in Areas of interest in India and tagged 14th Dalai-lama, Ashram, Ashtanga Yoga, Auroville, Bharata Natyam, Bird Sanctuary, birds, Cauvery, Chennai, Chidambaram, Chola, colonial French, cosmic dancer, dance, gopuram, His Holiness, Madras, Mahābalipuram, Mamallapuram, Mandala, Matrimandir, Māyā, Mira Alfassa, Mother, Nataraja, Parvati, Pavilion Tibetan, Pondicherry, Puducherry, Samadhi, Shiva, Shivakami, Siva, Sri Aurobindo, State, Tamil Nadu, Tamoul, Tanjore, Temple, Tenzin Gyatso, Thanjavur, Vedanthankal Bird Sanctuary, Yoga on 28 November 2014 by Jean-Claude Garnier.